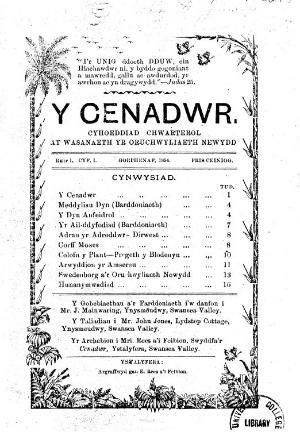 The Cendadwr was a religious Welsh language periodical. It circulated mainly among the Swedenborgs of South Wales, especially those in the Swansea Valley. The Swedenborgs follow the teachings of Emanuel Swedenborg a Swedish eighteenth century scientist and philosopher. In the words of the Cenadwr "The Cenadwr's ultimate aim is to explain and preserve the best loight on the Word as seen through the volumes of Emanuel Swedenborg". John Mainwaring was the editor of the periodical with Ebenezer Rees responsible for its printing. The periodical was issued quarterly and was sold for a penny.